Home › What are Dabs? Dabs are a wax like concentrate of THC, varying between 70% and 90% THC. It is usually refered to dabs, cannabis oil, or wax. They are used by those who have a high tolerance, enjoy a stronger sensation, or those who use it as their daily medication for treating a wide variety of diseases and conditions. With the regular flowers, you typically will either roll it into a joint, pack a bowl, or hit the bong. Some even experiment with homemade paraphernalia. Cannabis oil requires a large amount of heat to vaporize the oil. 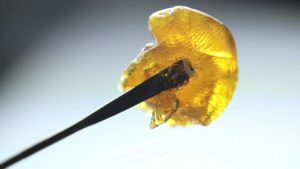 Similar to a bong, a dab rig, is necessary for for vaporizing dabs with minimum loss of product. You can also convert your current water bong into a rig simply by purchasing the necessary instruments and tools. The Base: Many think dab rigs are different than regular water bongs when in fact they are very similar. It is true the design and perks of dab rigs will produce the best flavor but if you are trying to save some money you can purchase all of the other necessary tools required for dabbing and you can call your bong a rig. The Dome: A glass dome piece that goes on last, after the nail is heated, and before the dabs are vaporized. Each dome has a certain size fitting that will fit onto the downstem. It is important to make sure your dome sits tightly onto the down stem as this creates a good seal. The Glass, Titanium, Electric or Quartz Nail: This is the element that will be heated up to a very high temperature, and allow the cannabis oil to vaporize. It usually made of glass, titanium, or Quarts and shaped like a carpenters hammering nail. The Torch: This is a refillable butane torch that allows you to heat up your heating element quickly and efficiently. If you spend a little extra money on an electric nail this step is skipped completely. The Pick (Dabber): You will need a pick (or dabber) to handle your sticky dabs and lay them out on the hot nail. Because of the high temperatures, it is best to use a sturdy metal dabber. Dabbing is the process of which you vaporize the cannabis oil and inhale the vapors. It comes down to two simple steps when it comes to dabbing. You first have to decide how big of a dab you want to take. For amateur dab smokers, it is wise to take a small dab at first. Use the dabber to scoop up your dab and lay it near the rig. You then heat the tip of the element until it is glowing red. This can be hard to see when it comes to glass and quartz but if you are in a room with low light you will be able to see the glow. You then take the dome and slide it over the nail and secure it to the rig. Be careful not to touch the nail or you will get a serious burn. Finally, you are ready to vaporize the dabs and inhale the vapors. While hitting the rig slowly touch the dabber tip to the heated element. After a few moments, twist your dabber against the walls of the dabber in order to get the full dab. Dabbing has slowly been increasing in popularity. People have tried to say dabbing is just a trend, but with more and more users interested everyday it is safe to say dabbing is here to stay. No Harsh Smoke: Dabbing is all vapor. No combustion ever happens, your dabs simply turn into vapor upon touching the hot surface. This has allowed those who dislike the harsh vapor of regular bongs to smoke freely without the harsh throat hits and tastes. Medicinal Values: The high concentration takes advantage of all the medicinal properties marijuana has. Sweet Smell: A lot of people like dab rigs because they do not leave a pungent marijuana smell. Depending on your oil you can smoke indoors without the worries of anyone identifying the odor. Cleaner Feel: The first thing you notice with dab rigs is they give you a much cleaner experience. Dabs have been said to provide more focus and to have higher medicinal benefits than the regular flower. 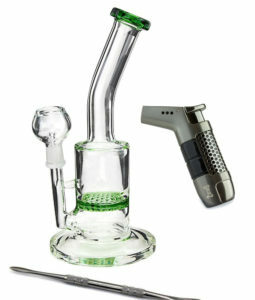 When ordering online, it is important to purchase your dab rigs, bongs, and other paraphernalia from reputable online head shops. Visit our shop page to learn about our top recommendations! It is also best to check out our headshops coupons page before making any purchases!